Chinatown in Toronto, Ontario has a vast display of shrimp and other types of fish at the market. 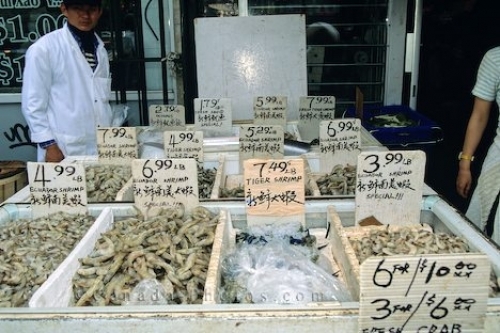 The fish market in Toronto, Ontario is open daily and shrimp is sold at fairly reasonable prices with many different varieties to chose from. There are six different Chinatowns in Toronto, Ontario and each fish market has prices that fluctuate a bit. Picture of an assortment of shrimp at the fish market in Toronto, Ontario.